If you plan to take a young child, you may want to sit in the rear of the Cathedral. Then, if he/she becomes restless, you can quietly slip away. Walk into St. Thomas Church at 53rd and Fifth Avenue any Tuesday, Wednesday, Thursday afternoon around 5:30 PM, and Sunday at 4 PM, and you will be pleasantly surprised to find a centuries old English choral tradition very much alive and flourishing. The vaulted stone Cathedral is the perfect acoustic backdrop for the extraordinary music you will shortly hear; the songs are sung by a world famous choir of boys and young men, crisp and handsomely attired in cassocks, gowns and robes. When the choristers begin to sing the traditional hymns accompanied by organ and orchestra, you will know you have stumbled upon something very special. Sit back and breathe in the music. 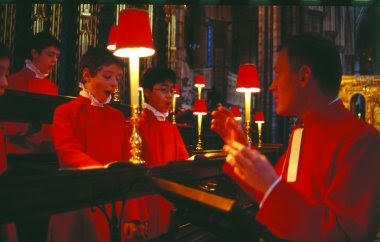 Evensong, a short 45 minute service of glorious music, is a painless way to introduce youngsters to classical masterpieces performed by talented young boys close to their own age (ages 8-13). These boys attend Saint Thomas Choir School, one of only four such schools still in existence in the world. They perform year-round at Saint Thomas as well as Carnegie Hall, Lincoln Center and for audiences around the world. The Choir School is committed to training and educating gifted young musicians; so if your son has a passion for music and a beautiful voice, encourage him to audition and apply. Visit the School's website at http://www.choirschool.org/. Whether you have children or not, this is a wonderful uplifting way to end a hectic work day or just find a moment's reprieve from the city's relentless pace. Address to Remember: Saint Thomas Church, One West 53rd Street, New York, NY, 212-757-7013. http://www.saintthomaschurch.org/. A wide selection of choral music is available on CD, click here to listen and order. Directions: From Times Square walk one block to Avenue of the Americas (6th Avenue), take uptown MTA B, D, F, V to 50th Street and Rockefeller Center. Walk a few short blocks to Fifth Avenue and 53rd Street.